Even if you plan each and every bit of a long journey, there are certain things which are out of your control, especially when you are in the ghats or the sharp curves of, say, Ladakh. Before leaving for the road trip, I had fully insured the vehicle, not because I was afraid about the trip, but I just wanted to be safe. Although I had relatives advising me that it was not necessary, it proved to be worth the effort. It is a cumbersome process when it comes to applying for insurance. The sheer amount of details to be added in a lengthy form is a tedious task in itself. It didn’t help when the entire digital shift happened either. The platform changed but we still needed to fill in ridiculous amount of details. And if, for some reason, you made a mistake or lost your internet connection, then good luck with filling the entire form all over again. Over other insurance companies, Reliance General Insurance grabbed my attention. It was because, they have a one-of-a-kind ‘Single Field Quote’ feature to obtain the cost of the vehicle’s insurance. Yes, you read it right. All it needed was to punch in my vehicle’s registration number, email ID and phone number. Their system fetched all the details of my vehicle’s make & model, age of vehicle along with the cost for the insurance. No hassles & extremely simple! Now considering taking my family for a trip to Ladakh, it is imperative that safety is my utmost concern. From breakdowns to tyre punctures, a lot can happen. I frantically searched for few garages around the areas of my intended route to be prepared for such eventualities. It is dreadful to imagine a breakdown late in the night & being stranded on the highway with your family inside. What would one do then? 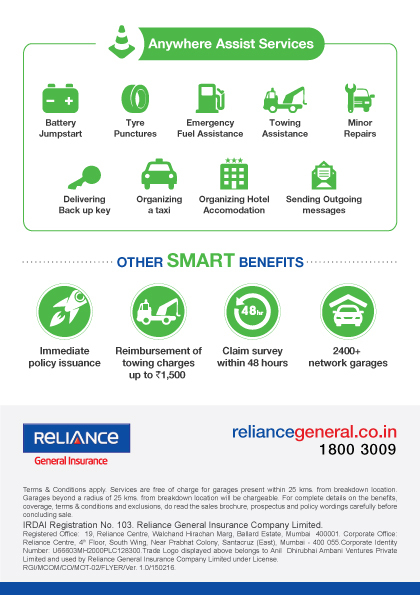 In addition to this,Reliance General Insurance has spearheaded the ‘Be the Safety Net’ initiative. The objective of their ‘Be the Safety Net’ initiative is to provide a focal point for young parents to learn about plausible areas where their children are prone to any kind of an injury or harm. They are educated about the preventive measures that can be taken as responsible parents to minimize the risk of these dangers in the future. The parents are informed about the risks that surround their kids that are sorted by location and risk category. This enables them to think from a new perspective of safety for their kids. The team visits various schools and articulates necessary road safety manual, which includes road signs and caution signals to enhance awareness about road safety amongst school kids. The team simulates a real life scenario by placing the kids on a mini bike along with all necessary protection gears and kids’ helmets. On successful completion of the initiative, complimentary helmets (especially made for kids) are gifted to the school kids. Reliance General Insurance has also partnered with Autocar India to make webisode series that provides safety tips for children while driving. This was a great all-in-one package that ensured I need to worry about anything & could now relax and spend quality time off with my family during the trip. So, in conclusion, one can head to Reliance General Insurance website and get their insurance ready in moments.